Teenage Girl Builds Her Own Car « Adafruit Industries – Makers, hackers, artists, designers and engineers! 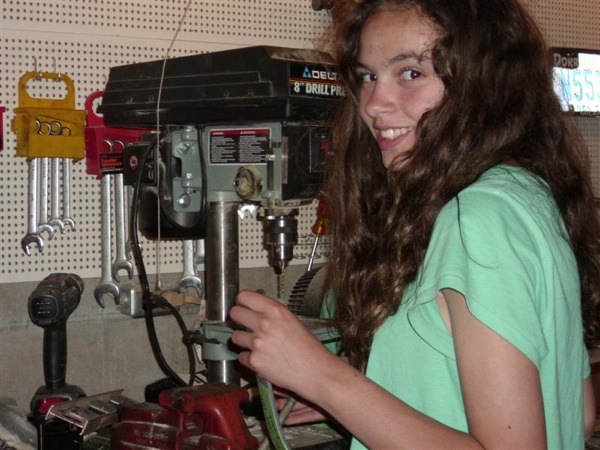 Teenage Girl Builds Her Own Car via Tim. Meet Kathryn! Her last name is unknown because she’s generally only known onPennock’s Fiero Forum as user Michhiker’s daughter. The family lives in Michigan, Mount Pleasant to be exact, and since the age of 12, Kathryn has shown a strong interest in cars. Well, a strong interest in buying and restoring her own Pontiac Fiero. By herself. Yeah, Kathryn isn’t interested in having Mommy and Daddy buy her a car for her 16th birthday — she’s going to go ahead and build one. Imagine encouraging every kid to build their own car as part of getting a license, drivers ed + making. That’s fantastic work but she might want to throw on a cap or a hair tie around that drill press. Given that the Fiero was originally intended to be a skinnable chassis, she probably could create several different variant bodies for her creation. Waiting to see what she comes up with. There are quite a few of us out there that got our first car this way, whether through economic expediency or in my case, the love of returning an old Volvo 145 to more roadworthy service. Re-engined and suspension rebuild, it loved curvy roads with a passion.